Pineapple Curry or Gulai Nenas is often made with shrimps but variations with fish and salted fish do exist. 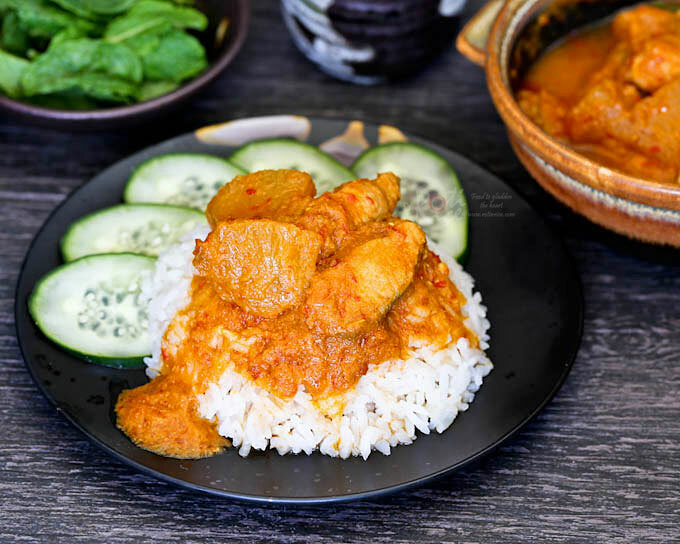 Although the anglicized term for gulai is also curry, it is distinctly different from curry in that the spice mix for gulai normally consists of fresh chilies, turmeric, lemongrass, belachan (shrimp paste), and tamarind. In many cases, gulai tends to be hot, spicy, tangy, and not creamy like curries. It is definitely a Southeast Asian concoction. The tangy taste in Gulai Nenas comes from the pineapples. The coconut milk helps mellow out the sharp taste, making it irresistible. Be sure to have lots of steamed white rice available as this dish really whets one’s appetite. Do also check out my other gulai recipe on this blog, Chicken Curry with Kaffir Lime Leaves. 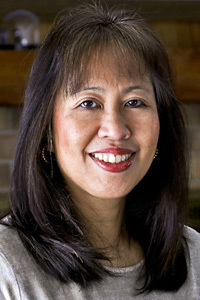 Belachan or shrimp paste is commonly found in Southeast Asian cuisine. It is made from fermented ground shrimp, sun dried, and cut into blocks. It varies in color from a pinkish grey to a dark chocolate brown. The kitchen should be well ventilated when using this ingredient as it has a very strong and potent flavor. Always buy the best quality you can find as a little of it goes a long way. Grind spice paste ingredients, except ground turmeric, in a blender with a little water if necessary. Remove and stir in ground turmeric. Heat vegetable oil in a medium sized non-reactive pot. Add spice paste and fry until fragrant, about 4 to 5 minutes. Pour in coconut cream and water. Bring to a boil. Add pineapples and salt. Bring it back to a boil. Reduce heat and simmer for 10 minutes. Add salmon and continue to cook for another 3 to 4 minutes. 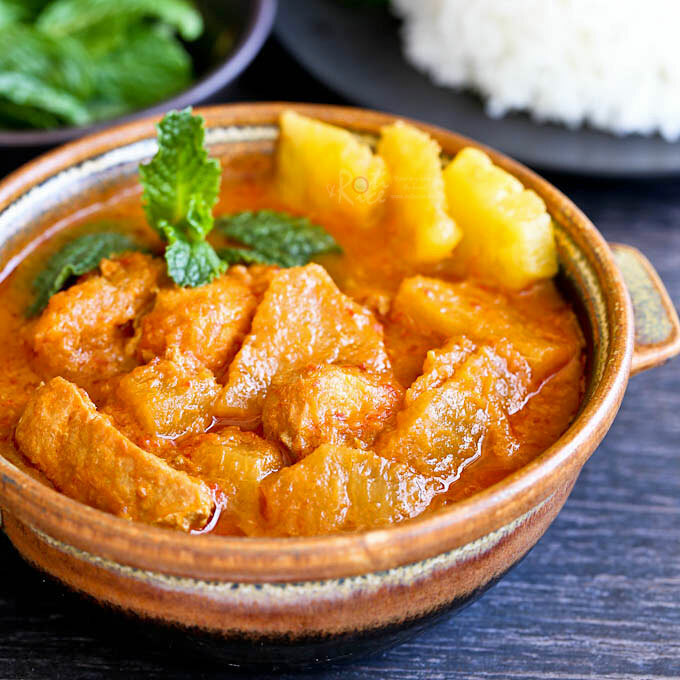 This Pineapple Curry with Salmon is best served with a steaming plate of white rice. Leftovers may be rehashed by diluting the sauce with a little water and serving it with thick rice noodles garnished with julienned cucumber, sliced chilies, and mint leaves. 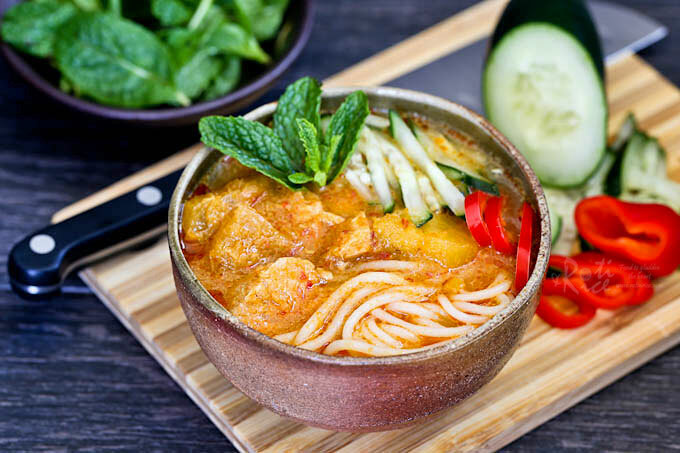 When served this way, it is reminiscent of Siamese Laksa. Do give it a try. NOTE: This post was updated on March 12th, 2016 with new pictures. First time @ ur space..u hv a amazing space out here with drool worthy dishes…visit mine as time permits.. I certainly will enjoy this if it is in front of me now! Looks so delicious! 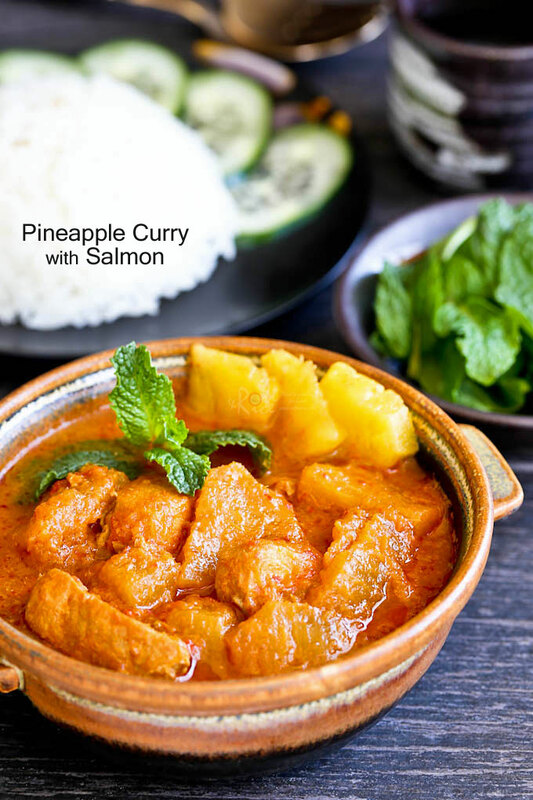 Pineapple-curry-salmon – seriously??? I’m so hungry now. This is so interesting, and beautiful dish. I love how well you explain everything to us. An excellent curry! I like the combo of salmon and pineapple, and awesome flavors here with all the spices and ingredients you use! Wow what an interesting mix, salmon and pineapple who would have thought 🙂 can’t wait to try it out! Oh wow, this is such a fantastic curry recipe…beautiful! Oh dear, this is absolutely mouth watering. What a unique and flavorful way to cook salmon. Sweet, tangy, spicy, and coconutty all mixed into one dish – love it! I love that picture of the bowls side by side to create one bowl, very smart and creative, Biren. A wonderful and delicious recipe. Even though I’m slightly allergic to pineapples, I’d still love to try this. I can eat lots and lots of this curry. Rice please! More rice please! Salmon curry? wow…that’s a luscious curry dish! The one served with cucumber looks so good! Have not tried this with salmon before! Looks really good and very appetizing! Ooi…sedap betul-lah! I enjoy pineapple in curry very much. Simply delicious. Yours look really really tempting. Pineapple plus curry equals “I’m in”. Love the combination. I’ll have to pick up a package of the belachan next time I’m at the Oriental market. Thanks for the recipe Biren. This combo sounds interesting! A very nice step by step picture instruction to. Thanks for taking the time to do that and share with us. Wow very creative! I’d not have thought of salmon in curry to begin with 😉 I bet they taste delicious too! I personally believe that salmon and curry are a match made in heaven! Love the sound of this, especially with pineapple – my favorite fruit! Wow…. I just came to your site and immediately liked your facebook page. LOL. I’m following you now! I can’t wait to see more of your recipes. Not only the photos are abosolutely gorgious, but oh boy I can imagine the taste. Thanks Nami for visiting and “liking”. Good to have you on board. 🙂 I love your recipes too and hope to try out some in the days ahead. This is a beautiful and interesting dish. Thank you for posting this! Pineapple and salmon is an interesting combo. Looks so good. The pineapple salmon looks so great, I have bought a while back some shrimp paste and since it used is such small quantities I still have lots. I’ll make this dish for hubby soon, he will love it. I love the use of salmon in this curry. I haven’t seen a salmon curry, and we eat salmon all the time. Lovely recipe. Thanks for sharing and please keep up with the good work.